Sandra de Blois has provided a detailed account of Geldy's situation. Geldy's family are endeavouring to adapt a derelict pig farm in order to house their horses and resume their work. 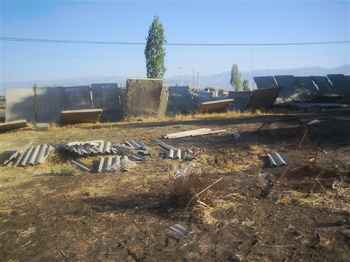 These pictures show the current state of their former farm. The demolition work of Geldy's farm threatened for 8 months, begun in January and halted on protests from four EU Embassies, has been resumed - this time on a Saturday morning to maximise the difficulties in mobilising Embassy protests quickly. 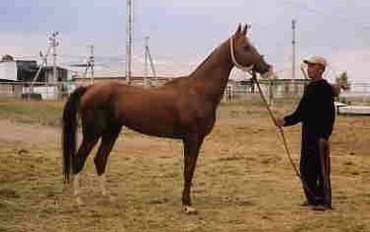 Geldy's stud farm was established on land gifted to him by President Niazov when land was distributed at the time of Independence. 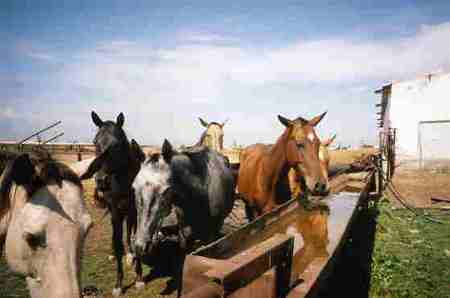 Last summer the members of the family still living there, and Geldy's ninety horses, were threatened with eviction. 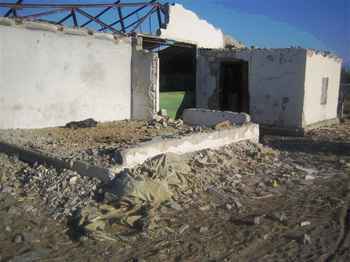 Geldy's family went to court and secured a written court order on 21st August 2006 signed by the Procurator of Ashgabat stating that they could not be evicted until alternative land had been found for them. In January demolition work was summarily begun at the farm. 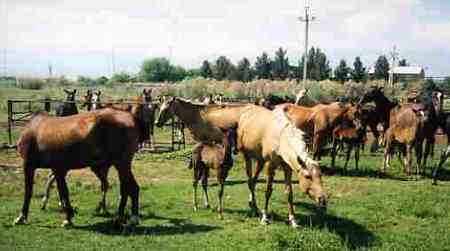 Geldy's family produced the Procurator's document, only to be trumped by one signed by Ashirmukhammedov, head of the KNB, on 9th January 2007, stating that the demolition must go ahead, and saying "Take those horses away!". 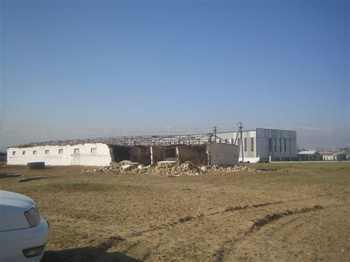 After written protests from the British Embassy, the French Embassy, the German Embassy and the Romanian Embassy were lodged at the Turkmen Foreign Office, demolition work was halted. On Saturday 10th March it was resumed, presumably timed so that it would be difficult to secure Embassy help quickly. In their Urgent Action Network call, Amnesty International report, "Geldy Kyarizov's wife, a doctor, had previously brought him medication in detention. However, his whereabouts were unknown between September 2006 and January 2007, and his health has suffered as he has not received this medication from the authorities. Geldy Kyarizov may be in grave danger if he does not receive adequate treatment immediately." Please support the Urgent Action Network call. 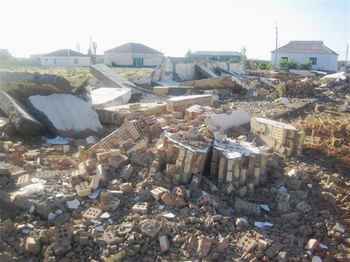 In a further development, we also learnt that work on the demolition of the family's stud farm has been halted, following representations from the British, French, German and Romanian Embassies. On 15th December there was a horrible development: a man claiming to be from the KNB (former KGB) visited Geldy's family and told them that Geldy had died under torture in the jail for political prisoners, Ovadan Depe. It is to be hoped that this is false, merely further intimidation. A summary of Geldy's story has just been sent to the Moscow office of the UK's Daily Telegraph newspaper, with copies to several UK Members of the European Parliament (MEPs). On Friday 20th October we received news that Geldy had "disappeared". It transpired that when his wife Julia went to visit him in Chardzhou Prison at the beginning of September, he was not there. No-one would tell her where he had been taken, and she was threatened with dire consequences to him if she told anybody about this. She was also told that he would be included in an amnesty of political prisoners shortly to be announced. The Kyarizov family kept quiet, as instructed, and all they said to us was that the situation was “very dangerous”. The amnesty happened on the 19th October (reported on the BBC website, see below), but Geldy's name was not on the list. The family were still unable to find out where he has gone. There is speculation that he is in a prison called Ovadan Depe, a place in the Kara Kum desert built for political dissidents (even the government have never accused Geldy of being a dissident; he is supposedly in prison for petty “crimes”) and which has a terrible reputation. We don’t yet know if this is true. However, it is consistent with information given by the OSCE (Organisation for Security and Co-operation in Europe) US branch to a member of Team Geldy: that a number of political prisoners were collected together by the KNB (formerly KGB) shortly after the EU decided to veto a trade agreement with Turkmenistan because of its Human Rights record; and that it was stated at the time that this was in preparation for the amnesty. Evidently, not all the people swept up in this process have been released. Geldy’s wife Julia has been unable to see him for nearly two months. This means that he has received no medication in that time. Since imprisonment he has suffered two heart attacks and a stroke, and his continuing high blood pressure gives much cause for concern. Report of the EU decision to veto trade agreement - the page includes a short section describing the terrible conditions at Ovadan Depe prison. Geldi's wife, Julia, with her sister Diana, took me to see the horses on two occasions. I saw about 20 stallions, in loose boxes in two barns (one had lost its roof in a storm, they have managed to reroof half of it so far). A woman was sweeping between the boxes, and the stallions were being led out in turn for a roll in the sand, and to be lunged. Their condition looked pretty good, a few perhaps could have carried a little more flesh, but none were seriously thin. 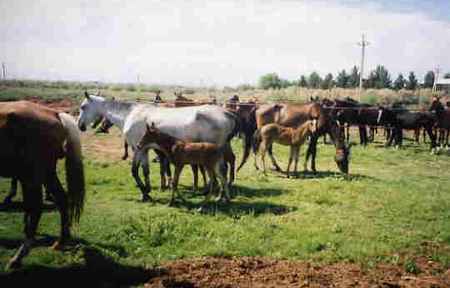 I counted about 7 foals: they and their mothers were separate from the rest of the mares. While in no way plump, again, none seemed to be seriously thin. Julia and Diana are in a difficult time as last year's hay is all but finished and the new hay they are negotiating to purchase is not yet baled. All in all I was pleasantly surprised at the overall condition. The site is tidy, with the help of a neighbour's tractor. I am so thrilled to see how wonderful the horses look! Let me impress on you what a major difference this is from when I last saw them during Summer '03-Winter '04. 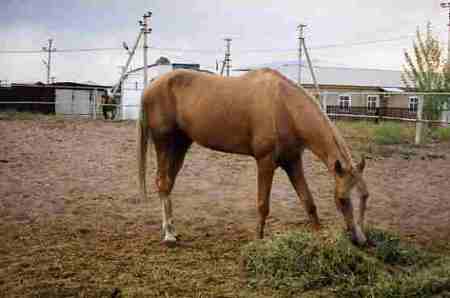 These horses are fat by Turkmen standards! Even the President's horses are at least this thin. It looks like they had good rain this spring, it is more green than I recall seeing there. Congratulations to all of you who have helped by sending money. You are looking at the fruits of that generosity when you see these fabulous Akhal Tekes in their homeland, sleek and shining.